Asafetida protects our health. Its smell is very strong. Eat asafetida in pea amount and put in banana leaves. This is beneficial in hiccup, vomiting and abrasion. Those who have weak memory power should mix 10 gram asafetida, 20 gram black salt and 80 gm bye-banging powder and mix all them together. Daily eat with little warm water. This improves memory. 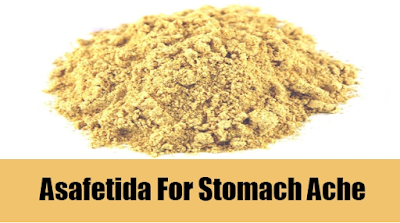 The daily use of asafetida in vegetable and lentil protects the stomach. Mix asafetida in water and prepare its lotion. Muffle it on chest for two to three days. This will remove cough. Due to bad intestinal stomach disorders occur. It is beneficial to have hingasthak powder. It is also beneficial to keep asafetida on teeth during toothache. Mix asafetida in water and apply it on skin disease. This gives relief from itching. Mix asafetida in goat milk. Put two drops in eat. It is beneficial when you are not able to listen properly. The mixture of asafetida with neem oil is beneficial in foot burst. In winter, asafetida with warm water and in summer asafetida with buttermilk is beneficial for stomach. This easily relieve the gas.